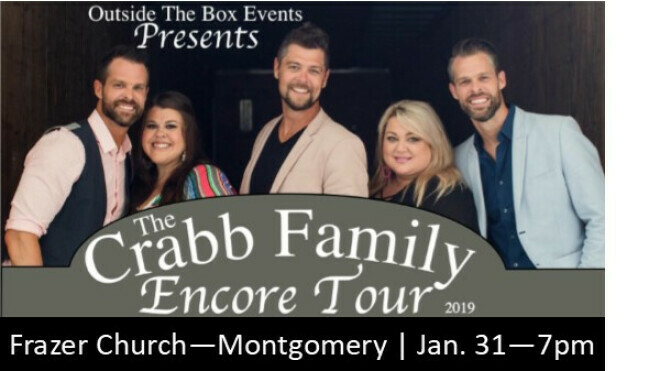 The Crabb Family will be in concert at Frazer Church in Montgomery on Thursday, January 31, at 7:00 p.m. Tickets may be purchased at the Frazer bookstore or online. You may also order by phone at 1-800-965-9324. For more information, please call Kim Hendrix at 334-495-6397. Use Code “2FOR1” and receive 1 FREE Ticket when you purchase 2 or more tickets (It works for all Ticket levels). Use Code “BIGGROUP” and receive General Admission tickets for $15 each (40% off) when you purchase 20 or more at a time. You will also receive a FREE Ticket with every purchase of 20.